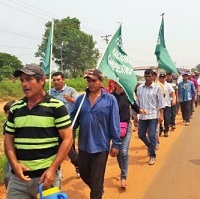 The closing down of a community-run radio in eastern rural Paraguay is the last example of repression in a country where 1,6% of ?its population controls 80% of its agricultural land. 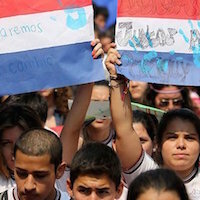 The mobilizations under the slogan #UnaNoTeCalles (UNA don’t be silent) have led to the removal of a large part of the corrupt hierarchy of the National University of Asunción (UNA); a hierarchy of university administration, and corrupt authorities tied to the old superstructure of power. “More than 20 years after being expelled from our ancestral land and living [in camps] along the side of the road, watching the cows occupy the place where we used to live, we decided to return because that land is ours,” the Sawhoyamaxa said in a message accompanying the petition drive. 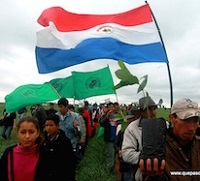 What Changes Lay Ahead for Paraguay? 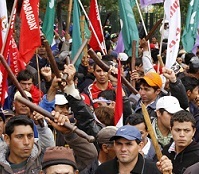 Instead of dealing with land problems, the government’s attention will be on keeping social conflict from growing in the cities, for which they’ll invent new ways to criminalize the urban poor by creating job sources that do not lead to work security, but rather to things like encouraging the maquiladora sector and deregulating the workplace. The issues of land and farmworker resistance will be treated in the same way they have for decades; that is, through persecution and repression. 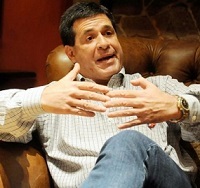 South America’s newest president has a checkered past, and a huge personal fortune. 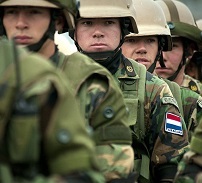 School of the Americas Watch, which sent a delegation to observe the elections, expressed concern at Horacio Cartes’ sympathy for the dictatorship, his public disdain for queer people, and his seemingly totalitarian aspirations.